Hello! This post is written by Brooke – I’m new here. I stumbled across The Confident Stitch this spring and I fell in love with the fabrics, notions and reviews in the blog. I’m thrilled to have the opportunity to write a blog post for this modern shop! Kate and Jane and I came up with a q-u-i-l-t-i-n-g project for you. That’s right – this is not garment sewing. We’re making a table runner! I’ve long neglected having a table runner at my house. With two young daughters, I often find spills and simplicity dictate our table decor more than what’s pretty or gives us joy. My girls are growing up, though, and in the past year I’ve slowly started adding some pretty, functional details to our table. 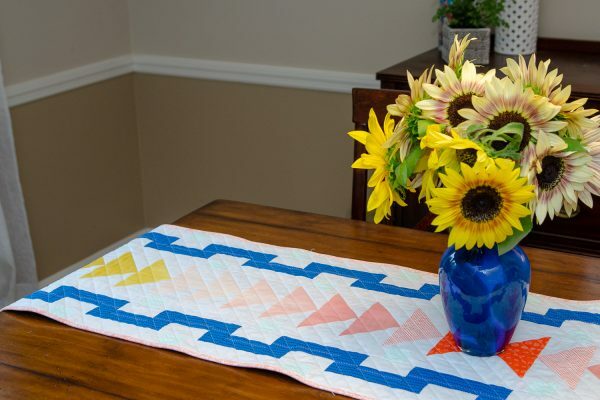 This table runner is the final piece! Let’s get started, shall we? Today, I’ll give you fabric requirements, a cutting chart, and we’ll make the borders. In our next post, we’ll make the center of the runner and put it all together. In the final installment, I have a little surprise for you! 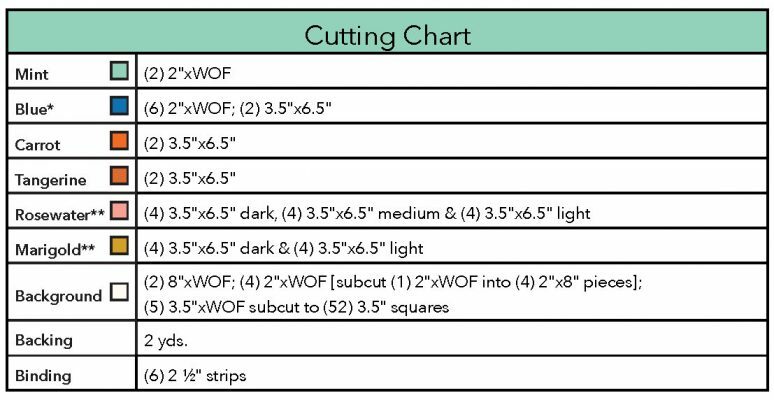 *Note: If using a directional print for the border Blue, you may want to cut the equivalent of (3) of the 2″xWOF parallel to the selvage in order to maintain directional appearance. **Note: Cotton + Steel Pigment fabrics were used for Rosewater and Marigold. Pigment is an ombre wash across the entire width of fabric. Therefore, each Pigment cut offers 2-3 shades. 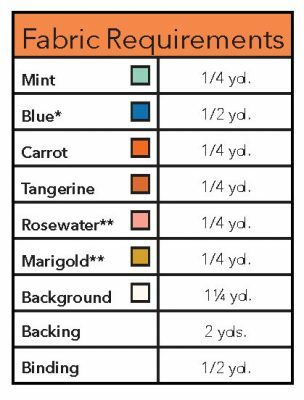 If you are not using Pigment, you may need to use additional fabric. Today, we are sewing the borders. 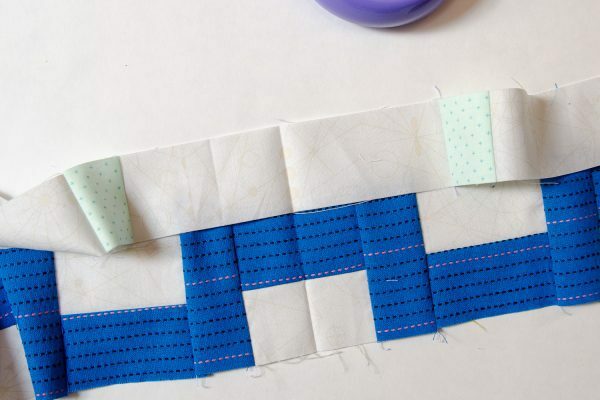 We’ll use a method called strip piecing to assemble the borders in a flash. 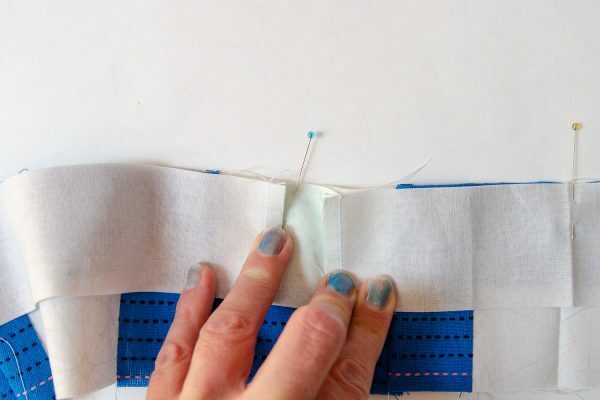 Step 1: Sew two (2) 2″xWOF Mint to two (2) 8″xWOF Background. Press seams. Step 2. Subcut units from Step 1 into 2″ sections. A total of thirty-four (34) units are needed. Step 3. 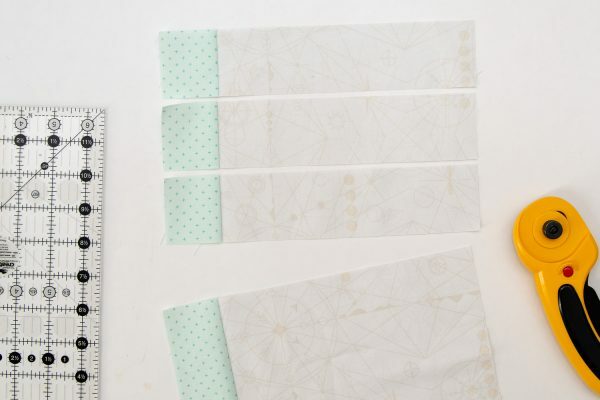 Take four (4) units from Step 2 and sew one (1) 2″x8″ background to the unsewn side of the Mint square. Step 4. To assemble Border Row A, take eight (8) units from Step 2 and one (1) unit from Step 3 and sew them end to end to create one long row. Repeat to make a second Row A. Set Rows A aside. Step 5. 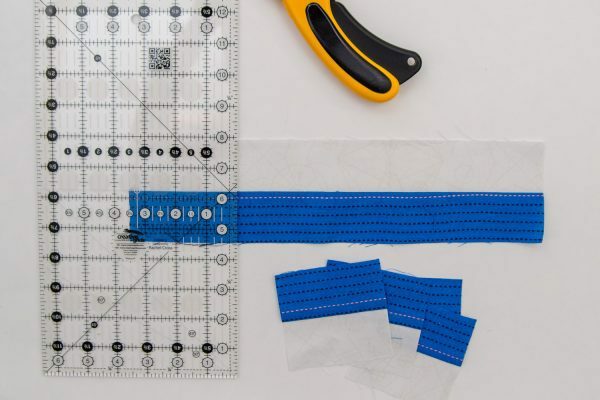 To assemble Border Row C, take seven (7) units from Step 2 and one (1) unit from Step 3 and sew them end to end to create one long row. Repeat to make a second Row C. Set Rows C aside. Step 6. 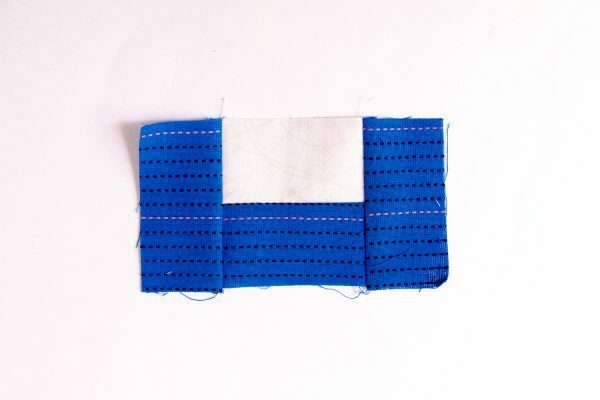 Sew three (3) 2″xWOF Blue to three (3) 2″ Background as shown in Fig. 6. Press seams. Step 7. 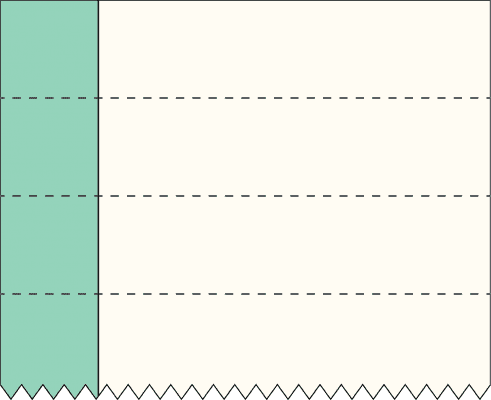 Subcut units from Step 7 into 3.5″ sections as shown in Fig. 7. Set units aside. A total of thirty-four (34) 3.5″ sections are needed. Step 8. Subcut remaining three (3) Blue 2″xWOF into thirty-six (36) 3.5″ sections. Step 9. 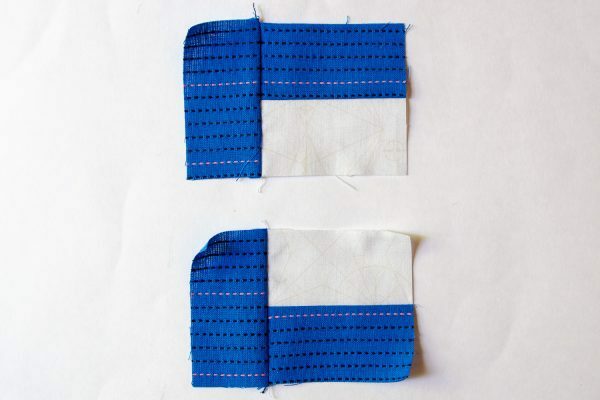 Sew a Blue piece from Step 8 to the left side of units from Step 7, rotating the units from Step 7 so that eighteen (18) have a Background rectangle on the top, and sixteen (16) have a Blue rectangle on top. Step 10. Take 2 units from Step 9 with a Blue rectangle on the side and a Background rectangle on the top. 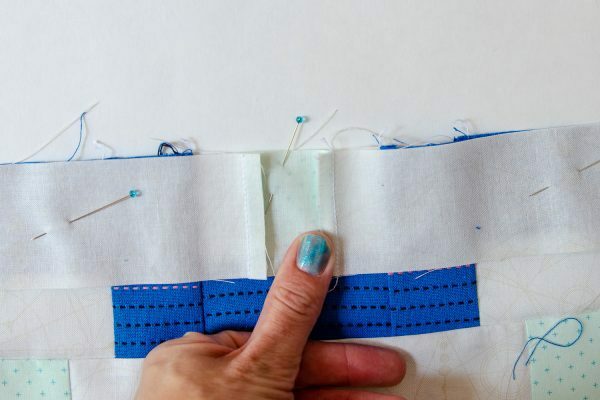 Sew a Blue rectangle to the right side of these units. These units will be the ends of Border Row B. Step 11. To assemble Border Row B, alternate units from Step 7 and Step 8. Both ends of Row B will have a unit from Step 10. Step 12. To finish the border, find the horizontal centers of Rows A, B and C. Press this center and align. Pin from the center to the ends of the row, centering Mint squares in the background piece from Row B. Note: Rows A and C are purposely longer than Row B. After attaching rows, trim to Row B length. That’s it for today! Hang on to your borders, and check back next week for the center row of flying geese and the finishing instructions. This entry was posted in Quilting, Tutorials and tagged In Confidence, table runner. Brooke is a mom, a vegetarian, and a quilter with a love of comedy and being silly. Most days, you’ll find her waiting until it’s an okay time to put on cozy clothes and wondering if she’s had enough coffee. Once a knitter, Brooke returned to her first love of quilting after a 14-year hiatus when her wrists stopped doing yarny things.